Today, I introduced a unique bill that goes in a completely different direction than everything else we’ve been hearing out of Washington. It would force politicians to start practicing what they’ve been preaching by lowering the debt ceiling from $14.3 trillion back down to $13 trillion. I’m increasingly convinced that there’s some kind of gigantic practical joke being played on all of us. But by whom? Who has the power to orchestrate such a thing? I think someone needs to waterboard Glenn Beck to find out. But back to Broun. Oddly enough, he concedes that “to be realistic, we can’t lower the debt limit today, but if we set a deadline, the beginning of FY 2012, it would force politicians to make those decisions in the months to come.” My back-of-the-envelope guess — and I’m not willing to do anything more than that — is that this would force federal spending down to about $1.3 trillion in FY2012. Slice off interest on the debt and you’d have about a trillion bucks left over. That’s enough to fund, say, the Pentagon plus half of Social Security and nothing more. That’s outside the box all right. You might reasonably ask, who cares? 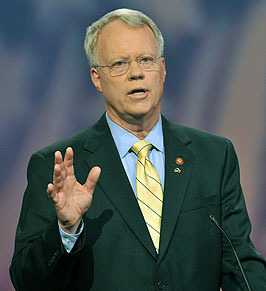 So Paul Broun is an insane wingnut. There are always a few of them around. Answer: because this proposal is currently being hosted by the fine folks at National Review. They don’t endorse it, of course, but presumably they think it’s sane enough to deserve a wider audience. This, ladies and gentlemen, is the flagship of mainstream conservatism. Revel in it.